Tio Leo's confirmed we can do the workshop in the bar as this is much easier than renting a dance studio. Material Covered: Intermediate & Advanced Zydeco moves that we don't have time to cover on Tuesday's. The material we will cover is not hard, it just takes a little more time to breakdown and practice the moves. Video: We will also review video from some hot dancers and discuss their styles and how this relates to our learning of the moves. RSVP - Not required but requested to gbenusa@pacbell.net or 619-857-8409 in case of any unforsene changes. Thanks to Jeanie we have a big selection of Zydeco CD's to pick from for the Zydeco Tuesdays coming up. Special Zydeco Music Mix this Tuesday @ Tio Leo's. There is a lot of great Zydeco dance music coming out of Louisiana so along with some tunes you probably have heard in the past, you will hear many new tunes with a little different style that I bet you have never heard at Tio's before. 6:30pm - By request if you want to learn the Zydeco Cha Cha Line dance I will put it on the screen if wanted to learn by video as I am setting up everything. 8:00pm-10:00pm - Gator Boy DJ'ing . For the guys/leads just remember if your left hand is holding your partners right hand in the open position, any movement she detects she will be trying to figure out if your trying to lead something or not. So try and keep your left hand somewhat low down by your waist. If your planning on coming up for just the day or if your camping or staying in a little motel near by, if you want to offer an activity please let me know. Maybe offer a few free massages, teach a little educational lesson, offer to lead a little nature hike etc... Of course we will be doing many activities but I just wanted to open it up to anything you would like to share to add to the weekend please let me know. Travel Web Site - I just heard about this travel web site and after searching a few fares, I was hooked. Scan My Photos - Here is a grate deal that I recently took advantage of. Scan 1000 pictures for $49.95. They scan them and send you all the 300 dip scanned files on a CD back to you along with your images. You just box up the photo's and send them up to Irvine. Or if your worried about shipping them, just drive them up and pick them up a week later. This is a great little festival at a very historic location just south of San Francisco a bit. It's a great opportunity to drive up to a festival and make it a 3 day weekend taking in other tourist stuff around the area. This is a BIG east coast Cajun/Zydeco festival. I have been several times and loved this festival! We reserved the nice Yerba Santa Group Spot for the weekend of September 26th. (it was the first weekend that it was available) The weather is still warm at the end of September and this is the nice outdoor site where everyone is welcome to come up for just the day, or stay overnight in the group camping spots for Friday and Saturday just Saturday night. There are also small cabins available in the area if you don't want to camp but would like to stay overnight in a cabin. We will do a pot luck on Saturday night if you want to bring something to share. Of course we will do a camp fire, hiking, poker playing and other activities to keep up in and out of trouble. Will post more details as we get closer but mark the date if your interested. Local C/Z Schedule compliments of our Bon Temps Club ! For what else is going on that weekend, check out Louisiana Sue's web site at the following link..
August, Labor Day Weekend, Southwest Louisiana Zydeco Festival, Louisiana Baby !! September 27th & 28th, Saturday Adams Avenue Street Fair! 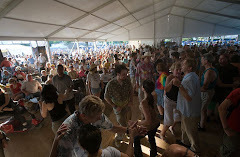 You can't beat the price of free and there will be Zydeco this year! November 2nd-9th - Zydeco Cruise 2009 !! December 31st, New Orleans & Lafayette Louisiana 2008!! Huge Zydeco festival in the heart of Houston!!! It's a biggie baby !! The lineup of this festival is very impressive !!! Featuring 15 bands playing Zydeco, Cajun, New Orleans R&B and Delta Blues straight from deep in the bayous. Fresh boiled crawfish, jambalaya, shrimp Creole, fried catfish, grilled alligator sausage make great music even better. 10 - 7. $30. Sussex County Fairgrounds, Rt. 206 & Plains Rd..
Internet Message Board for Zydeco Dancers..
DISCLAIMER: The information above is gathered from many places and people. There maybe last minute changes or on rare occasions incorrect information. It's always a good idea to double check before heading to a specific event to verify the details of the event. If you do know of any information that is incorrect please give me a call at 619-857-8409 or email gbenusa@pacbell.net.